Yes, it’s possible to get through a family road trip without the incessant “Are we there yet?” cacophony. Or stops every ten minutes for bathroom breaks. And of course, siblings fighting in the backseat. 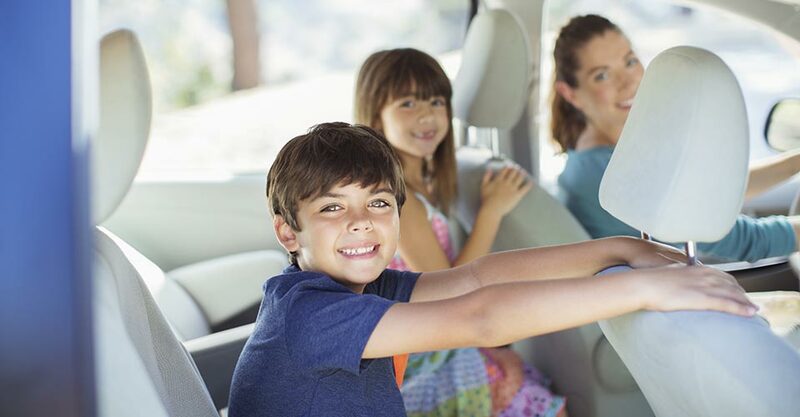 In fact, a road trip done right can actually be more fun than a long plane ride, where kids often have to sit still for a lot longer and can’t leave the plane until the final destination. It just takes a little planning and ingenuity (great snacks don’t hurt either). Whether your trip is three hours or 24, have a grab bag of ideas at the ready: car games, projects, activities, and the like! Get the kids involved with the planning: Give each one a map with the route marked on it so they can track their progress. And plan your stops ahead of time so the kids know how long they have to hold on before the next break. We know you’ll most likely have to pull over for “emergency” bathroom stops, but if you plan some fun detours along the way to your final destination, you’ll help pass the time and have something to look forward to. Ask your Personal Assistant to help you plan your route; we’d be happy to find some kid-friendly pit stops. Bring plenty of healthy snacks: Whether it’s baby carrots, nuts, grapes, or lots of bottled water, these will eliminate the need to stop for munchies, while also keeping the kids occupied and satisfied. As tempting as it may be to easily throw in some sugar-loaded pre-packaged junk food, don’t. You’ll thank yourself later when your kids aren’t on a sugar high in the confines of your car. So there you have it. Have any great tips of your own? We’d love to hear them! Share them by emailing us at info@TLFamilyClub.com.